It’s that time of year again: students are in the midst of exams and everyone is preparing for the holidays. But it’s also time for the artists within the Dal community to show us their talents at the annual Student, Staff, Faculty and Alumni (SSFA) Exhibition. This year marks the 59th SSFA show and, as usual, the work on display features a wide range of media, subjects, and formats – everything from traditional watercolour paintings to pieces in more unusual media. Here are the stories behind just a few of the great contributions you can discover at the exhibit, which runs through December 22 at the Dalhousie Art Gallery. (For operating hours, visit the gallery's website.) An opening reception will be held Thursday, Dec. 13 at 8 p.m. Professor emeritus in the Department of Biochemistry at Dalhousie, Ford Doolittle has been submitting art to the SSFA exhibition for the past 20 years. He’s been attending NSCAD University part time almost as long. Dr. Doolittle’s submission to this year’s show, a triptych of digital photos titled Sin and Redemption, is testament to his years of hard work — and to his passion for the medium. Dr. Doolittle took the photos in Dublin, Ireland when visiting for a conference. Aside from the location, they’re also linked by the colour red: reflections in a bar window; a pair of shoes nestled together outside Dublin’s General Post Office; and a religious iconography shop. The title, of course, pulls the three together. The medium of photography is presented another way in 49 to 55, a delicate collage of 20-some photos transferred onto silk organza and hand-stitched together. The photos were taken from Dalhousie University yearbooks between 1949 and 1959 – back when Anneke Henderson’s parents were students at Dal. 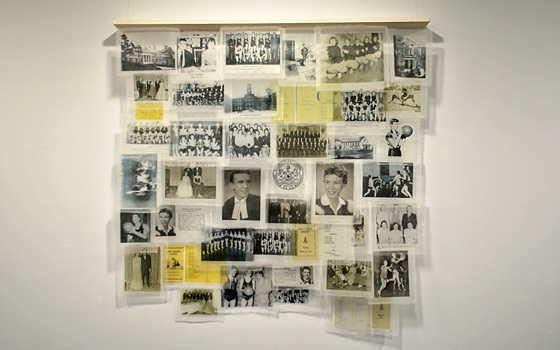 Most of the images in 49 to 55 (see image below) are glimpses into her parents’ social lives, from varsity teams to the many formal dances they attended (including Prof. Henderson’s favourite image: her mother’s dance card from a Munro Day Dance). Those discoveries illuminate the community side of university life. “You spend a lot of time with the same people in your own field of study, sharing experiences,” she explains, adding that she hopes her own students appreciate the relationships they’re building now. He first creates his images in Photoshop, then grids them for transfer to canvas. “My mouse dexterity is something fierce!” he says. His skill with a paintbrush is a force to be reckoned with too, thanks to formal training in draftsmanship. Small flags, including those of the students’ home countries, were carefully overlaid inside a map of Canada, creating a mosaic effect. In the corners are words meaning “hello” and “comprehend” in Chinese, Arabic, French and a regional dialect of Burkina Faso. Prof. Mushtaq says the project was “a covert method of teaching vocabulary, encouraging critical thinking and generating discussion in class,” as well as an opportunity for the students to participate in university culture outside the Department of Continuing Education as they prepare to begin regular academic classes at Dal in the winter semester. Collaborating on the collage were students from China, Saudi Arabia and Burkina Faso: Mohammed Al-rashed, Wenfen Zhu, Jian Han, Jing Zhen, Noha, Nouf, Hankun, Arnold Zound, Mohammed Nasser, Sultan Alanazi, Wael Jefry, and Khaled Al-qahtani. Also representing the student population is Kelsey Evaniew, a second-year student in the Sculich School of Law. While completing her physiology degree, Evaniew was too busy to draw. But now her interest in human physiology has another outlet. She says drawing helps her maintain her life balance: “Doing art . . . ensures I’m not studying all day and night,” she adds. When Dr. Jock Murray was doing post-graduate studies in the late 1960s, he and his wife went to England with their four small children. They were poor students, he says, but they bought a Westfalia camper van and made trips around the UK on weekends. Memories of that year are captured in one of Dr. Murray’s three submissions, 4 Kids and a Westfalia, a charming portrait of the blue camper van in question. The piece has an unexpected feature: hanging from the bottom of the frame is the original license plate. Both of Shannon’s paintings are playful explorations of colour using different techniques. Calm is a small painting of a dingy against bright ochre sand and deep blue water, with smooth, almost invisible brushstrokes. Currents captures a bloom of jellyfish in thick purple and blue impasto paint – it’s “the result of seeing what appeared when I put way too much paint on a canvas,” she says. She adds that during their month-long painting challenge, she and her father emailed photos of their work to each other. “He is my kindest critic,” she says.